Changing customer demands, high levels of risk in global markets and globally dispersed partners are among the key risks facing manufacturers, according to a survey by pollsters YouGov for GTNexus. The results, published earlier this month, show four in ten manufacturers have experienced a supply chain disruption impacting their business in the last 12 months – whether external, such as from weather or strikes, or internal, from technology problems or shortages of talent, for example. As the report notes, the findings potentially underplay the issue, with other studies showing up to three quarters of businesses experiencing a disruption each year. “Virtually no business involved in producing or selling products is immune to supply chain disruption. Events such as natural disasters that impact supply chains are unavoidable, and a host of other disruptions – everything from supplier shortfalls to product transport challenges to labour strikes, terrorism and social unrest – occur with surprising frequency,” it reads. Despite this, three quarters of manufacturers operate without a Chief Supply Chain Officer, the survey found. Instead, the findings suggest manufacturers will be increasingly reliant on technology to ensure effective supply chains. Among the top level findings, the survey reports that advanced analytics and the Internet of Things are expected to prove key technologies in boosting supply chain performance. It’s difficult to fault this: the complexity of modern supply chains increasingly means a technological solution is essential for a coherent view. The report authors are also far from alone in recognising the importance and potential of the Internet of things in enhancing visibility across the supply chain. Moreover, the challenge of achieving visibility and the potential benefits technology could bring are not unique to manufacturing. Similar lessons are just as applicable to sectors such as healthcare and pharmaceuticals. Yet it’s also obvious that technology alone cannot answer the challenges facing businesses’ supply chains. First, firms need the right people with the insight and expertise to seek and apply the technology available effectively. Second, businesses need commitment at the top to address issues of supply chain resilience to begin with. Unfortunately, that commitment is not always as solid as it should be: Another recent survey of pharma and healthcare firms found that, despite unplanned events having a major impact on them, 40% of supply chain decision makers in these sectors still didn’t rank contingency planning as a critical area for investment. Without a commitment to address that problem, technology will only ever be able to do so much. Time for a fresh approach to ESG supply risks? Are traditional supply chain methods failing when it comes to companies’ environmental social and governance (ESG) policies? It depends on what you count as success, according to a recent report by the University of Sheffield, picked up by The Guardian. It suggests traditional ESG auditing approaches to supply chains are “working for corporations, but failing workers and the planet”. The report’s assessment of corporate schemes using independent auditors to monitor factories, develop codes of conduct for suppliers and publish transparency and ethical reports is damning. Another problem noted is that the “auditors” of these voluntary standards, reliant on the companies for business, have no real power. As it quotes interviewee: “[Y]ou cannot open a locked drawer … you can look at a record that says something but you wouldn’t be able to go and find out whether it’s actually true”. That’s reinforced by cases it notes of sites that have passed audits only to have major violations revealed or catastrophes soon after. It’s certainly worrying reading. Despite this, it’s hard to agree with the report’s authors entirely. One note of caution is that the report’s scope is not huge – 25 interviews over a two-year period with ethical auditors, business executives, NGOs and supplier firms. That, though, doesn’t invalidate some of the points raised. The key problem, rather, is that it’s difficult to accept the conclusion: that the regime is “working” for companies, despite the failures it outlines. If the auditing regime is not effective in picking up and preventing scandals such as the collapse of the Plaza garment factory in Bangladesh in April 2013 or revelations of slavery and human trafficking in the Thai shrimp industry in 2014 (to use its examples), then it is failing companies, too. As those examples show, abuses that are allowed to persist ultimately result in scandal or tragedy. Neither benefits businesses, which have commercial as well as moral reasons to prevent them. If the auditing approach is failing, businesses have every reason to drill down to their supply chains and try to put that right. 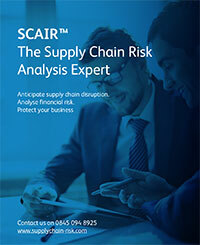 As of 2016, the downloadable Product Summary for SCAIR highlights the features of latest iteration of this award winning SCRM / Supply Chain Risk Management Software. SCAIR is used by some of the world’s largest Pharmaceutical and other manufacturing organisations, not only to determine and mitigate value at risk, avoiding global profit fluctuation, but also to assist with liquidity analysis and Corporate Governance.